A naturopathic approach to seedy toe will layer the approach with herbs; your first layer is to cleanse, and the next layer is to restore tone and repair the affected tissue, leaving the body stronger and less vulnerable to reoccurrence. This can be done very simply. You can build your individual approach using some key herbs, and then adapt your approach as your horse responds. The core herbs suggested here are herbs that will help with both the cleansing as well as the restorative phases. The lymphatic herbs such as clivers and calendula are key to the cleansing phase and with cleaning the tissue. Clivers internally, is one of the most nutritional herbs available and once cleansed, can then continue on to support with the restorative phase. 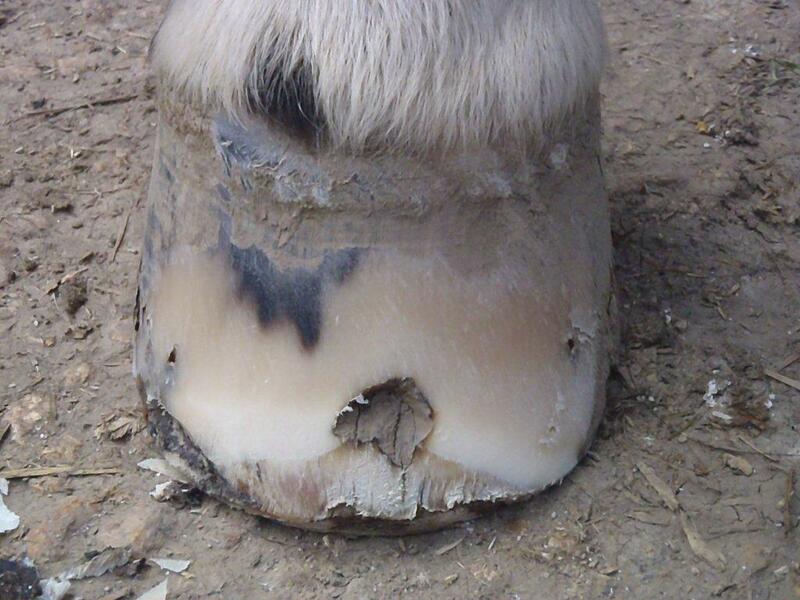 Clivers is especially indicated if there is a history of abscesses. Calendula flowers can be used internally if there is a large amount of infection, but its main use here is externally in a wash made with 5% tea tree essential oils added to a 50/50 mix of calendula tea and apple cider vinegar. Combine your ingredients use a squeezie bottleor use a large syringe body (no needle) and squirt to rinse the affected area. Rosehips will also help with strengthening the horse’s immune system and support the clivers with rebuilding the foot. Yarrow is a mild anti-inflammatory and also helps cleanse the body by improving circulation to the limbs, and gently flushing the kidneys and liver. It will assist with the discomfort and keeping a good healthy circulation to the foot. This overall approach can be safely given long term and it is worth giving clivers and rosehips for a couple of months after the seedy toe has resolved to ensure the hoof remains strong. As a guide, initially you will be giving 1 to 2 heaped tablespoons of each herb, i.e.clivers, calendula (if needed), rosehips and yarrow; once or twice a day. Then depending on your own horse you will tweak with any additional herbs. I am focusing on dried herbs, they are easier for the horse owner to obtain and add to a feed. If you are giving five or less herbs, then the amount of each herb you are giving is most likely to be 1 to 2 tablespoons daily. This will vary with some herbs and the stage of the condition, so use this as a general guide. If you end up selecting only one herb, give up to 1 cup daily. Any more and your horse will not be utilising all that you give, and your money is being wasted. Other herbs can be used, depending on how your horse is and his overall wellbeing will determine the combination of herbs that best work each time.